Ever feel stuck? Like there’s no way forwards? Like you’re living in the consequence of decisions made a long time ago, and that the dead end you’re now in is inescapable? You need to think about Frogger. Frogger was a game I got mildly addicted to a long time ago when my teenagers were still toddling. It mostly involved hopping a little frog around on lily pads and getting it to the other side of a road or a river. The picture I had today was of a frog who had hopped out along a particular line of lily pads, and then got to the end of the line. He looked across and saw other frogs hopping along another line of lily pads and thought ‘oh well, that’s it then, I went the wrong way, I blew it’. It’s easy to feel that one choice you made or that was made for you has messed everything up… that you’ve gone off on a diversion from the main route and can never go back. Like somehow you will never be able to live fully in the goodness of what God intended for you because of one foolish/stupid/scared choice you made and there is no way to get back onto the right track again. Of course we do often have to live with the consequences of our choices… but the truth about frogger is that there’s always an alternative route… even if it looks like there isn’t. Any moment now a new lily pad will pop up, or even better, a floating log will come along to hop on to and take us somewhere completely new! When we get to one of these ‘dead-end’ places, we have another choice: We can sit on our lily pad feeling sorry for ourselves, wondering if God has forgotten us, berating ourselves for the decision we made that has got us into this place, putting all our faith in our stuckness or we can call out to God and trust that he is able to do something about it. And of course- he can. There’s never only one route across the river, and as I was thinking about last week when I wrote this, our God is a the master of reversing impossible situations. He isn’t just creative -he is Creativity. Finding new ways to get you to where he wants you to be is as natural to him as breathing is to you. ‘You are stuck, it’s hopeless, there’s no way out’ is one of the regular often-used lies of the enemy. It’s designed to paralyse you, to stop you from realising that there never was one perfect, easy route across the river; that everyone either makes stupid choices, or encounters obstacles and that our creative father constantly builds new routes for us. If you’re feeling stuck today, like you hopped off the main path and onto an inescapable road to nowhere, take a real step and ask God to help you let go of that lie. Reach out and catch a hold of the truth that he has never for one moment forgotten you, and ask him to help you grasp the truth that your life is a constantly growing ‘new creation’ and that he has more enough power to build you a new route across the river and into the places he has called you to be. My problem is often that I want to see the path marked out in front of me. I want to be able to think, “oh I’ll hop there, and then there, and then there and that will take me to where I want to be”. My life just isn’t like that. I often cannot even imagine how God is going to take me into the things he’s spoken to me about, let alone plan the route! Whatever your struggle is, I pray that God would speak to you today and that he would open your eyes to trust in his extraordinary creativity and love for you. It will be worth it. “He isn’t just creative – he is Creativity” Love this! Thank you so much for this. I really needed to hear it. Have just been turned down for another job and was beginning to panic. Bless you! Thanks! This one was more difficult to pin down with words than a lot of the others have been, and I was nervous about posting it, so I’m so happy that God has used it to speak to people. P.S> I’ll be rooting for you on Saturday, as I’m a big fan of theministersmrs. Would have liked to go to the conference, but only one of us can leave the island at a time in term-time and Andrew had to go as he is leading a seminar there this year! 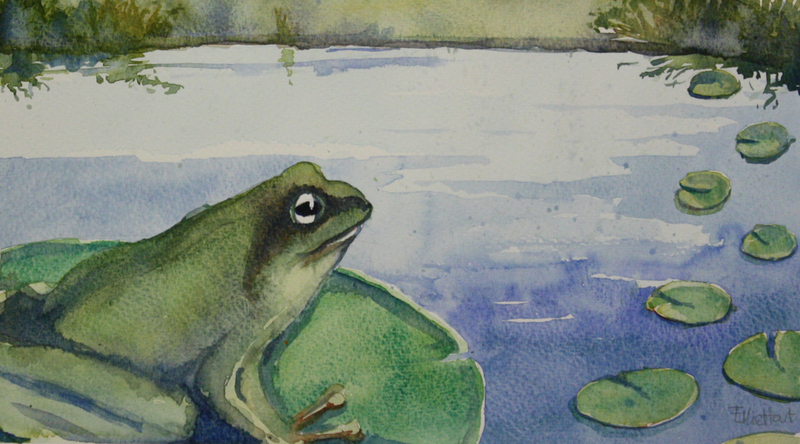 Very happy to have found your blog site, your Froggy postcard is very timely for me, thank you. ta Fran. Hope you’ve made your peace with ‘Miss2’. Looking forward to it. Sure it will be unMissable… …groan.